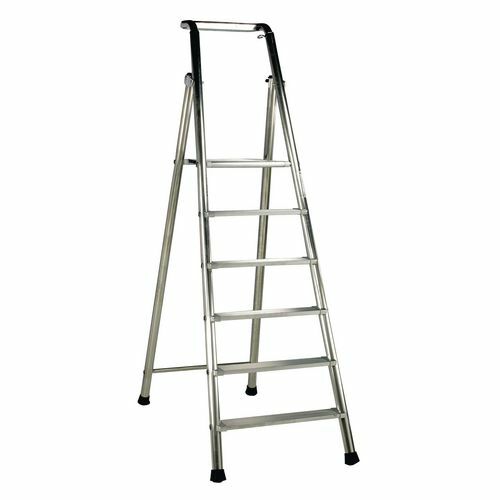 Super strong, heavy duty step ladders tested to 350kg capacity. Large slip resistant, centre-folding platform. 700mm high safety knee rest with integral aluminium tool holders. Optional 2 wheel kit available. 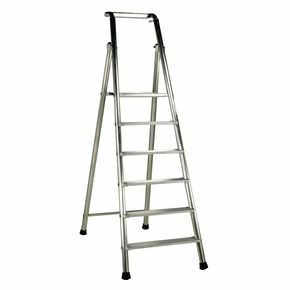 Whether you have lots of stacked items you need to get access to or if you work at height a lot of the time, our extra heavy duty step ladders are ideal for you. Made from aluminium, these ladders are strong and durable, in a choice of 8 heights; 960mm, 1200mm, 1430mm, 1670mm, 1910mm, 2410mm, 2380mm and 2850mm - these options will allow you to find a ladder to let you access the correct above-ground level for your work. A high safety knee rest ensures you work securely and comfortably helping you achieve maximum efficiency in the tasks you are doing. An aluminium tool holder is also an added benefit meaning you don't need to go up and down the ladder to have access to your tools. They are foldable making them simple to transport, when they are folded they are only 310mm deep. Their 100mm deep treads give extra foot grip for the user ensuring their well-being, allowing the user to work without fear of slipping. 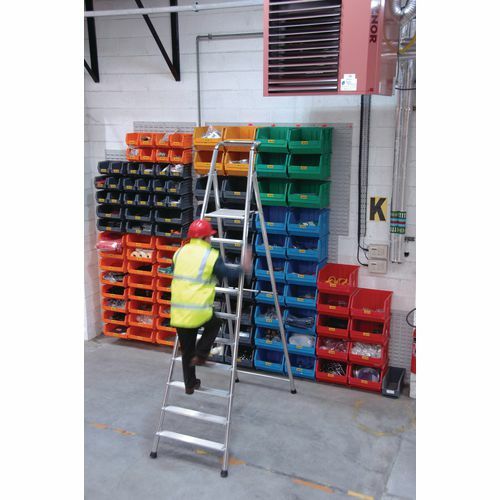 Our extra heavy duty step ladders conform to EN131 and are approved to GS standards. They come with a 60 month guarantee and FREE UK Delivery on this product.